Let's say you're just wandering around the Yucatán Peninsula, looking for Mayan ruins or training for a marathon or whatever. Then all of a sudden the ground gives way under you, your leg slips, and next thing you know you're waist deep in clear water at the bottom of an underground cave. Talk about one hell of a discovery. 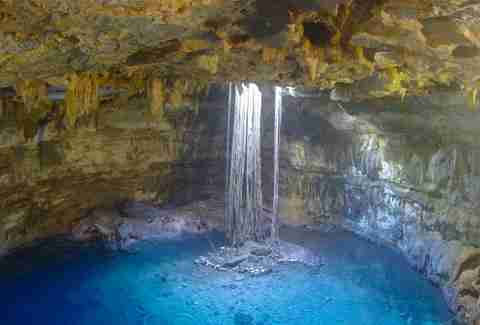 And that's almost literally how many of the nearly 7,000 cenotes in Mexico's Yucatán Peninsula were discovered. 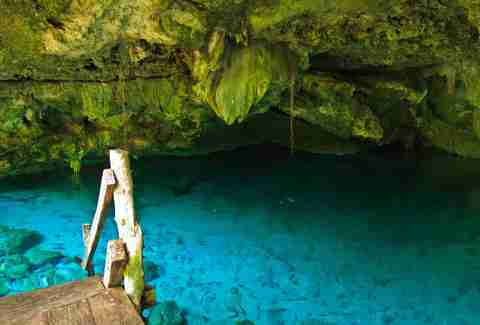 These secret underground caverns are formed when limestone caves in, leaving a hole in the earth that leads to a pool of often gorgeous turquoise-colored water. Some cenotes (pronounced cey-NO-tays and derived from a Mayan word for "well") are part of a massive underground network of rivers and caves that remain, for the large part, unexplored. Others are just afternoon swimming holes or cave-diving destinations. The cenotes are almost all within a 45-minute ferry ride from Cozumel or a couple hours' drive from Cancun, and many lie along the routes to the region's popular Mayan ruins. And sure, while visiting all 7,000 might be a little daunting, here are 10 you should absolutely catch on your next trip south of the border. 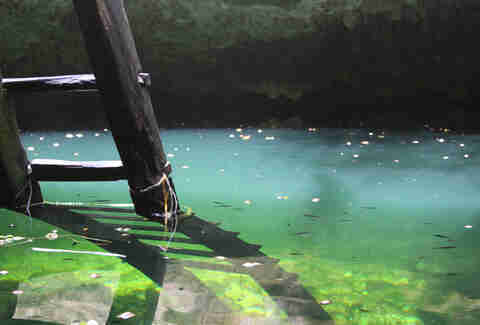 Though its proximity to a major tourist attraction (en route to the Mayan ruins at Chichen Itza) makes it one of the more crowded cenotes, this 60ft pool comes with a restaurant, gift shop, and a well-lit limestone staircase that leads swimmers to the hanging vines and blue waters below. If you're extra adventurous, there's also extreme diving; it's so intense Red Bull held a dive competition here a few years back. And you thought your city's swimming holes were cool? 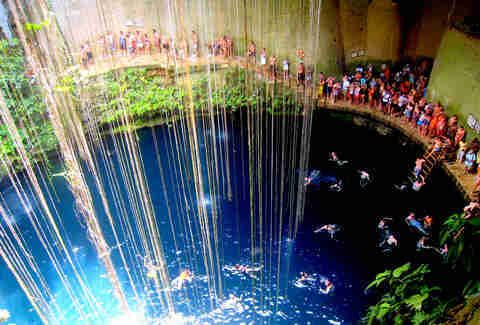 They've got nothing on Valladolid, a small Mexican city that boasts the country's only in-town cenote. At Zaci, you can hike into the 260ft cave and enjoy a shady respite in the middle of a stressful day at the office. Before you start swimming with the blackfish, however, keep in mind that you're right next to a bunch of city sewer lines. This cenote sits on a private ranch outside Valladolid and boasts some of the clearest water of any watering hole in Mexico. Water so clear you can gaze to the bottom of it from the observation platform. Although gaze is all you're gonna want to do (the water is inhospitably cold) either before or after enjoying the daily performance of Mayan dance. Dos Ojos is far more than the two caves (or eyes, actually) that its name implies -- it's a system of caverns that extends at least 38 miles at a depth of over 350ft. That said, the two main attractions here are Blue Eye and Black Eye. The Blue Eye is a world-renowned diving destination where divers swim underwater before surfacing in a real-live bat cave (with actual bats, not super heroes). The Black Eye offers almost no visibility, requires portable lights, and is one of the eerier and sensory-depriving dives you can make. 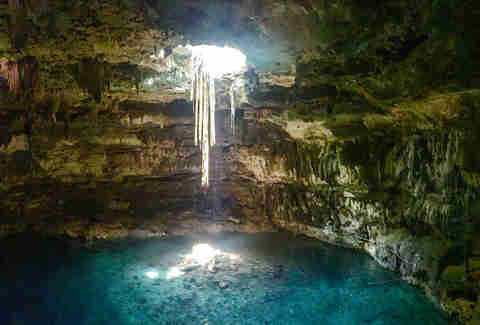 You've got three cenotes to choose from in Cuzama, each offering visitors a different experience. For the tree-root-dropping-into-a-cavern" cenote, walk down the old wooden staircase at Chacsinicche and watch the light bounce off the water and dangling roots. For vibrant, blue-green waters that shine bright due to minimum lighting, check out Bolonchoojol, a dark cavern lined with stalactites. 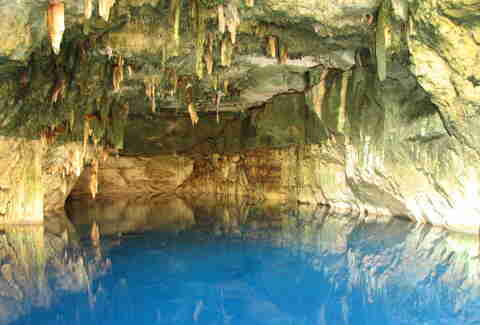 And for the truly adventurous, there is an unnamed cave with limited access that leads to, well, another cenote. It's not well-marked and perfect if you're looking for something remote. Though chances are you won't have any giant bowling balls rolling after you here, this cenote is alternately known as the "Temple of Doom." But easy, there, Indiana, this isn't so much a place to find missing villagers and escape in a mine cart, as it is a place to cool off after a hot day hiking around Tulum. The name -- which means "skull" -- comes from for the three holes in the ground that formed it; from above, it looks like, you guessed it, a human skull. The largest of those holes leads to one of the least-crowded underground swimming holes in the region. Since the only light that comes into this popular cenote is from the small hole in the roof, the best time to visit is the middle of the day; light beams straight down and gives an almost heavenly-spotlight to the waters below. Unfortunately, there'll be a ton of other people there to bask in the light with you -- it's crazy popular. If you want to make it an afternoon, swimming is allowed (they've got a lifeguard!) and you can even lounge on the small island in the middle. 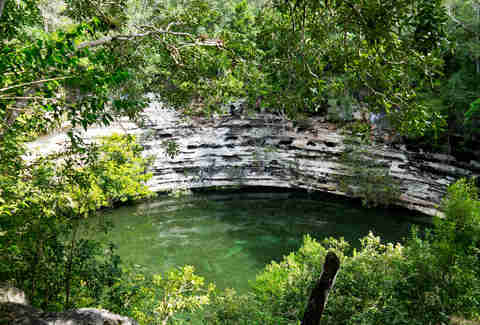 The area known at Dzitnup has two of the region's top cenotes: The aforementioned X'keken and this one, which opened much more recently and is typically less crowded. It's still got the natural skylight in the roof and nourishing tree roots that almost touch the water at the bottom. The cave is also illuminated at night with purple lights, giving it a distinctive "club in a cave" feel. 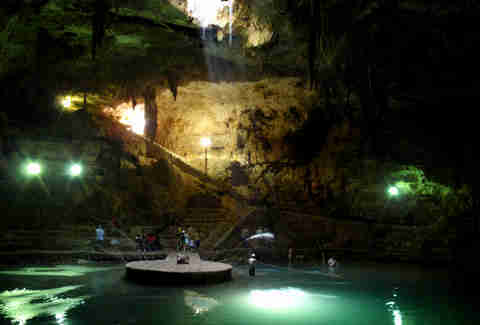 While swimming isn't recommended, for cenote photography aficionados, this one can't be beat. 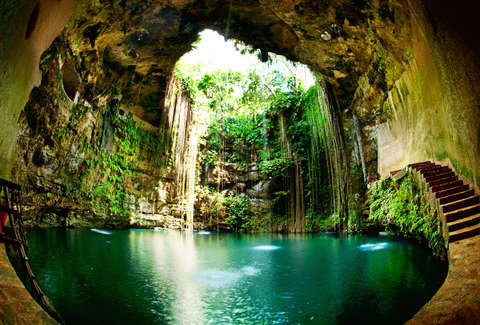 Because it's located right on the highway to Coba, this giant cenote is possibly the most-visited in the Yucatan. Then again, the fact that it's like a remote tropical beach in an underground cave might also have something to do with it. Or that the path to the white, sandy shoreline at the bottom descends through gardens of tropical foliage. 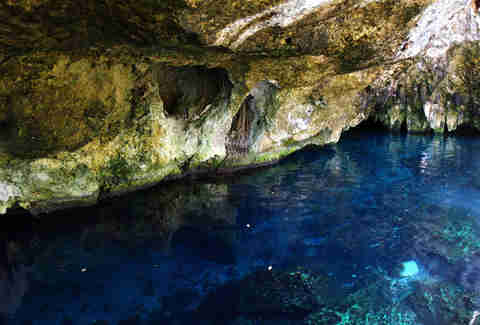 Snorkeling is the main attraction here and swimmers come face to face with a rare triad -- fish, turtles, and stalagmites. This little spot is also known as the Well of Sacrifice, because you guessed it, people were sacrificed here. 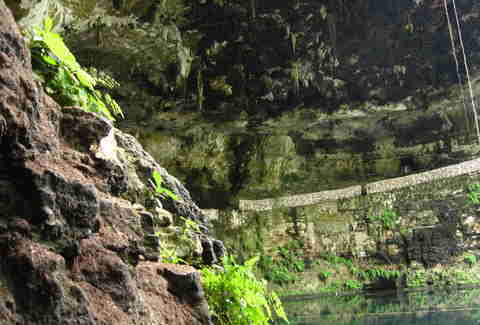 That might sound like a crazy Mayan legend, but in the early 20th century, the cenote was excavated and in addition to stuff like gold and pottery, archaeologists found human remains. While it doesn't make the view into the deep green water any less spectacular, just remember that 1,000 years ago it was the last view a lot of people saw. Matt Meltzer is a staff writer at Thrillist. Follow him @meltrez1.